narnodel's review (This content has been automatically translated from French)" Excellent!" All settings need to sculpt the perfect sound ... Nothing more, nothing less. It seems a little light, electronics is actually very simple, but it looks sturdy, and the system switch to spring almost unbreakable! A tenth of a revolution in the mid setting, and the sound has nothing to do! That said, the connected line, it is also correct, it does not replace a real amp, it always seems a bit dull. However, to model or to plug into a live sound is very respectable. I also have the power engine 60 of the same brand (power amp - guitar cabinet), and there is just great! I tested the settings advised by tech 21, I looked for other, there is a palette of its very, very broad, and what sound! 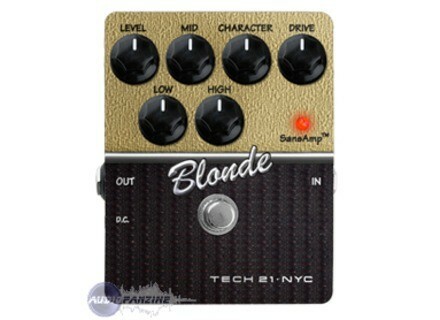 I have used for years and plugins GuitarRig TonelabST Vox, this little pedal is well above. I bought in the U.S. with two other models in the series (the VT-Bass and Liverpool), both excellent too! 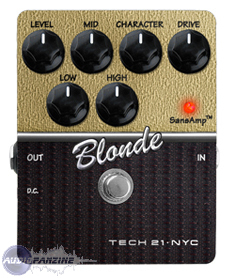 This seems expensive for a pedal that simulates an amp, while the ToneLab which costs the same as most other 33 simulates effects ... But the sound is so much better, warmer, more dynamic, the quality / price ratio is worth the trip (especially at 120 euros). The big difference between this pedal and simulators I've had before is that before I spent hours on these gas works out good sound, and now I will have to spend hours choosing my among the almost infinite palette of sounds fantastic to me that opens! I had a look on the schematics of the plug, of Liverpool and the British ... Each time, there are only two values ​​of resistance and a capacitor value that varies. One would think a scam, but liverpool and the blonde is actually completely different ... The electronics of these creatures is of the utmost subtlety! nico21120's review (This content has been automatically translated from French)" Superb pedal"
Pedal to prampli presents a boti mtallique, itself comes in a beautiful cased well, also in metal. The technology employed is Entirely analog transistor. The connection is altogether common: an instrument between an outlet for power between a standard 9V (not supplied), pretty bad place if you use a pedalboard. Housing for the 9V battery is located under the pedal, a valve, which Does not require any screwing opration / dvissage. Rglages level, there are 6 pots, whose bill leaves a good impression: level, low, mid, high, character, and finally drive. Finally there is a simulation of HP Jensen (by Tech21 site), not switchable. That said, the pedal is pretty well finished, and looks solid as a whole. To be picky, I always regret, especially in this price range, that the food is not provided. 6 buttons turn, can seem a little, especially compared to pramplis numriques Line 6 or Vox, but they are damn effective in their tasks and associated dlivrent a palette of sonority s much larger that there could stepfather at first. We can start by getting hold of the examples provided by Tech21 type (a can, alternatively, to discover that, unfortunately, some are Ted Nugent, and then, after investigation, that this is not the kind type that we want to frequent providers to find ...), then tweak its sounds ideal. The qualisation offers 3 bands is an extremely effective! We have to go with subtlety. Similarly, levels of volume, character, and gain should be based on each doss each other to obtain optimum sound, and especially to avoid to leave a tympanum ( or both!). Obviously, there are no presets memorize. Well yes a ring, but so what was ringing. My first impression, plus a whole grain apprciable is that it is alive. The sounds of very clean overdrive fleshy (hairy), if indeed it remains in cohrent rglages are all excellent for me. Pure rock n 'roll former, or rhythm of vitamin n'blues at Stax, and the Chicago Blues, while the boys! Obviously we can prfrer other series character models according to their tastes. So I can use it between my little console to play through headphones or recording directly to PC. What I find also gnial is that the effect of speaker simulation as it is not back subtly caricatured as one can find on other pramplis. And plugs into my amp (IDAL through the effects loop, even if it goes very well between the direct instrument of the amp, as long as I stay on channel clear), however, that I enjoy dj well as the pedal provides more punch supplmentaire qu'intressant my sound without the speaker simulation comes gcher everything. While I am, I also plugged my bass and electro in my north to see, and some remaining rglages, it plays well in her role prampli. I had long awaited a single product, which Plutt than imitate 4 semi-trailers amps, allow me first of all to have the same feelings gaming headset complies with those obtained from an amp. I am very happy. My neighbors are also very happy, even if the fact that the SansAmp Tech 21-Series-character-blonde offers excellent sound quality, they pass completely through. The banker, not jumping for joy, saw that the thing is far from a rate that expensive (even if he too does not care that rang royally). My only small regret in the end is that the absence of 2 channels is done quickly sorely felt.